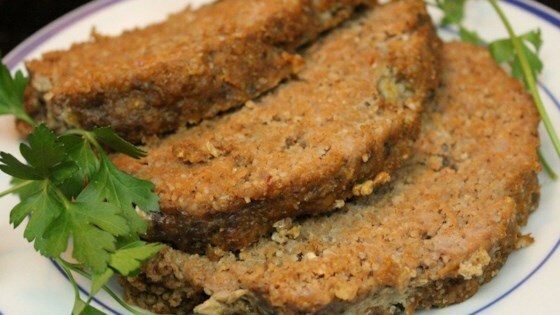 "With this recipe you can enjoy a taste of sausage and grits in a meatloaf. This recipe uses the grits as a binder instead of the bread crumbs used in a traditional meatloaf recipe. The slow cooking method results in a firm yet moist meatloaf that not only tastes great for dinner, but can be thinly sliced for next day lunch sandwiches. Use your favorite barbecue sauce instead of ketchup, if you prefer. Serve alone, with gravy, with ketchup or BBQ sauce. Makes great sandwiches cold or warmed in a buttered fry pan. " Fold each sheet of aluminum foil in half lengthwise, then fold in half lengthwise again, to make 2 strips of foil 4 inches wide by 16 inches long. Place the strips into the bottom of a slow cooker in a cross, so that the long ends of the strips come partway up the inside of the cooker (to make lifting handles). Spray the inside of the slow cooker and the foil strips with cooking spray. Mix together the ground beef, pork sausage, egg whites, grits, onion powder, garlic powder, ketchup, and liquid smoke flavoring until thoroughly combined, and form into a rounded loaf. Gently place the loaf into the slow cooker on top of the crossed foil strips. Cover the cooker, set on Low, and cook for 5 to 6 hours. To serve, carefully hold the ends of the foil strips, and gently lift the meat loaf from the cooker by the foil handles to place on a serving platter for slicing. How wonderful! I like my meatloaf firm and usin' grits just makes perfect sense! I was surprised how good it was. My family is skeptical of me trying new things and they enjoyed it very much. VERY dry; extremely disappointing, and I followed the recipe exactly.